Vauxhall’s manufacturing plant in Luton has built its 250,000th second generation Vivaro, since its production started in 2014. The milestone Vivaro vehicle was handed over to BT Fleet Solutions, Vauxhall’s biggest Vivaro customer. Vauxhall is the UK’s number one commercial vehicle manufacturer, a position it has held for 17 years, since Vivaro production first started. The total Vivaro build, including the first generation model, is 1.2 million, since production began in 2001. Of these, 274,020 Vivaros have been sold in the UK, including over 14,000 so far this year. 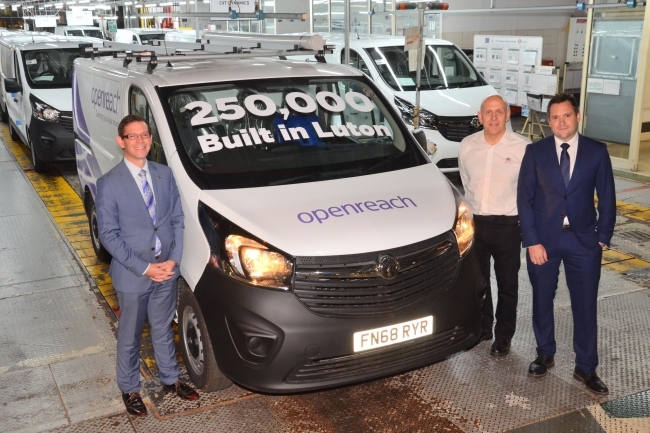 Henry Brace, Managing Director of BT Fleet Solutions added: “I’m delighted to take delivery of the 250,000th Vivaro on behalf of BT. We have purchased 25,000 Vivaros from Vauxhall over the past 14 years and they have served us well. “As with all the 30,000 plus commercial vehicles on our fleet, we work very closely with manufacturers like Vauxhall to source the right product that is able to meet the needs of our people today and for the next five to seven years. Earlier this year, Groupe PSA, which produces vehicles under the Peugeot, Citroën, DS, Opel and Vauxhall brands, announced its plan to produce a brand new, next generation Vivaro at Luton next year. Groupe PSA’s plan includes investment in the plant to increase its production capacity to 100,000 vehicles per year.